When it comes to a home, small should not mean claustrophobic. In fact, with a little help from thoughtful furnishings, color picks, and organizational tactics, even the quirkiest alcove can evolve into a beloved spot. Whether you’re looking to maximize a small closet or are learning to live in 600 square feet, we have tricks to help you make the most of decorating small spaces. While short on square footage, there are countless opportunities to take advantage of in tiny, often-overlooked spaces. Being smart about small space decorating is important from a practical standpoint—there is only so much under-bed storage, after all. Step one to opening up possibilities: Edit. Get rid of anything you don't need; then create smart zones for everything you do. "When space and storage are limited, it's easy to feel overwhelmed," says Joanna Teplin, cofounder of Nashville's The Home Edit. "By paring things down and utilizing creative solutions, you can really embrace the space you have." With a few tweaks, you can infuse your small space with big style. Next, avoid visual clutter—think multitasking, small-boned furniture and well-chosen art. "Too many frames can make the walls feel like they're closing in on you," says Dallas interior designer Moll Anderson. "Focus on just one piece of colorful artwork instead—such as a large-scale print, a vibrant photograph, or an abstract painting." No need to play it safe, though; diminutive rooms can be ideal places for bold hues and pops of pattern. "I adorn every inch of these spaces with color and layers of design," says Lacy Phillips, an interior designer based in Pensacola, Florida. From cozy cottages to teeny studio apartments, small spaces have big potential. Here are a few of our biggest ideas for the tiniest of rooms…they may even convince you to try one of our tiniest house plans. Walking into Amie Corley's stunning office, you'd never guess that it was formerly an abandoned caretaker's apartment located in the carriage house alongside her 1907 home. The St. Louis interior designer recently realized her longtime dream of transforming the old and empty attic into a home for her growing business, but the space posed a whole puzzle of challenges—including low windows, limited plumbing, and pitched ceilings dipping to 7 feet. She transformed part of the space into a kitchenette that holds plenty of secrets. Corley employed a favorite tiny-kitchen trick by covering the 30-inch refrigerator, 18-inch dishwasher, and microwave with matching cabinet panels. "There's no stainless steel to distract the eye," she says. Embracing the comfort, Corley went all in with her favorite hue, Farrow & Ball Stone Blue (No. 86), painting the walls, trim, cabinets, banquette, and ceiling. "Covering everything in one color actually keeps a small space feeling more open because your eye doesn't get cut off anywhere," she says. Sconces can be used in place of recessed lights or pendants (when those aren't options). Nestle them anywhere to brighten up enclosed spaces. "They give the same feeling as adding a lamp, but you don't need room for a table to go underneath," Corley says. The banquette's skinny drawers are ideal for tile samples; Corley bought even more space by skipping rails (those slivers of cabinet that sit between drawers). In the kitchen, a floating shelf offers airy storage without the closed-off look of cabinets. Whether you're embracing extra space in your attic or basement, low ceilings and awkward window heights can be a challenge. Designer Amie Corley created an inviting sitting area in her office for clients and friends alike. In the sitting area where Corley meets with clients, a Lee Industries sofa coordinates with the walls. It's upholstered in a Pierre Frey velvet of a similar blue. "Blending big pieces like a sofa into the wall color creates an almost negative space, letting your eyes rest and enabling you to add contrast or pattern elsewhere," she says. "I chose small-scale pieces so as not to bulk up the space too much—a sofa with tight-track arms, slipper chairs, and brass dining chairs that are smaller than most," she says. And don't even bother with spindly coffee tables. In multipurpose rooms like this, a sturdy table will often be converted into an extra work surface or an impromptu spot to sit. St. Louis designer Amie Corley needed her desk area to be a white backdrop for design work. She made it both attractive and functional with smart cabinetry, floating shelves, clutter-taming baskets, and jolts of yellow. What you don't notice in this busy workspace: office equipment. The tall, skinny cabinet next to the desk houses a printer, Wi-Fi router, and other unsightly electronics. To keep the office feeling more cozy than corporate, Corley lined her shelves with baskets stuffed with fabric samples. "The magical thing about them is that they fully disguise their contents and can also make a room look pulled together and expensive, much more so than other types of storage bins." A corkboard wraps the wall above the desk to play up the natural texture of the storage baskets. Because a standard rolling chair would have looked too ho-hum, the designer instead selected a cushy chartreuse chenille seat and complemented it with a matching lampshade on the brass sconce above. Lastly, the brass Waterworks hardware on the cabinets mirrors the warmth of the bright chair and adds a dressy sheen to the room. Add a statement-making banquette to a corner of your living room that might otherwise be occupied by a random piece of accent furniture. A window seat needn't be more than 16 inches deep, says interior designer Andrew Howard, who decorated this living room just outside Chapel Hill, North Carolina. 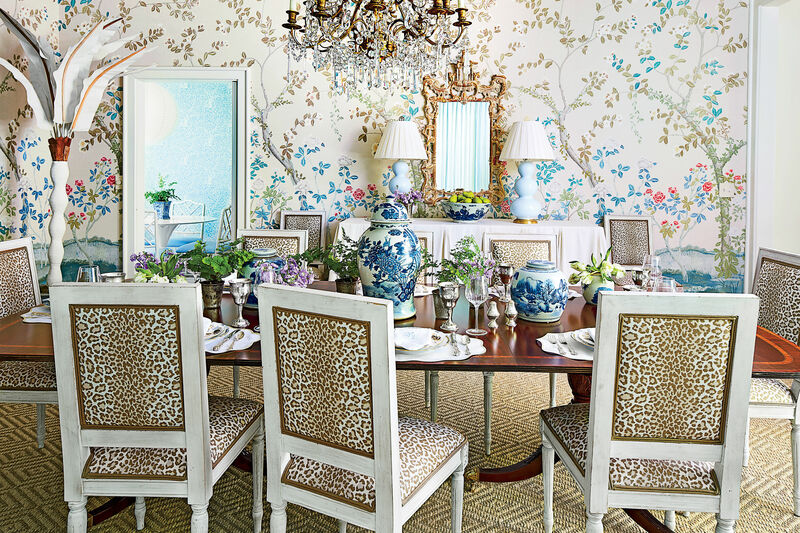 This is a wonderful place for party guests or family members to relax and converse—and also a spot to sneak in a few layers of color, pattern, and texture. "There's nothing I hate more than a brown wood chest in the corner of the room; this banquette softens up everything and also creates an intimate seating area," he adds. One key to successfully pulling off this decorating scheme: Mix and match patterns to keep it cozy, not overly formal. On pillows in such a compact space, Howard prefers to keep the prints relatively small and similar in scale to each other. Here, the green Zen Garden fabric by Ferrick Mason contrasts with the blue motif on the L-shaped bench, which is upholstered in Pavilion in Bay by LuRu Home. This Roman shade (Kashgar Rubia by Lisa Fine) frames the corner area and connects to the other curtains—all hung as high as possible. "Hang drapes close to the moldings to trick the eye into thinking the ceilings are higher," suggests Howard. Lacy Phillips, an interior designer from Pensacola, wanted this 10- by 10-foot side entry to serve as a hardworking drop zone for her busy family of five— but the window's positioning meant that she couldn't add built-in cabinetry without blocking the natural light. The solution: a unique shoe bench she purchased at Peachtree Antiques & Interiors in Atlanta. It offers storage and rustic charm, while two strips of oversize hooks from Pottery Barn hold everything from bags to jackets above. Roomy baskets stash sports equipment (not pictured). Paneled walls are painted a light tone, which keeps the area from feeling cramped or cluttered. "The ceilings drop in this room, but the vertical paneling makes the space feel taller," Phillips says. The neutral paint color (Benjamin Moore's Puritan Gray) keeps the mood modern and bright and flows seamlessly into an adjacent playroom painted the same hue. Colorful pillows from World Market coordinate with the vintage rug and serve a second purpose—to discourage dropping any personal items on the bench. "Small spaces must be well organized: Bags go on hooks, shoes are put in slots, etc.," Phillips says. "We do our best to keep it clean and clear to allow room to sit and to make things look tidy." When redoing this kitchen for a young family in Dallas, interior designer Amy Berry transformed a previously unused window area into a bright breakfast nook with a sunny disposition. The biggest challenge? While the ceiling and windows are about 10 feet tall, the dining space is only about 8 feet wide. She knew she would focus her design on a round pedestal or trestle table. These allow you to squeeze in a few additional people when needed, since the centered base prevents awkward straddling of table legs. Berry also loves a built-in bench, which can always accommodate one more tiny diner yet, to the eye, reads as just one streamlined piece. "It's important to tally up legs in a small space—between the table and chairs, you don't want to have too many," says Berry, who picked these retro Modway chairs with a simple base to balance out the busier crisscross design of the Redford House table. One area where more is more: throw pillows, which are many designers' favorite way to add a nice touch of pattern and softness (even when there's little room for furnishings). Don't be afraid to pile "em on, as long as you don't overdo it. "You should be able to move around a bit without any of them falling on the floor," Berry says. Meanwhile, go light when it comes to chandeliers. This modern geometric fixture from Mr. Brown is playfully juxtaposed with the round table. It doesn't overpower the tight space, thanks to its lightweight corrugated-cardboard construction and washed-out shade. "If you have the space to create a corner nook like this, get a carpenter to put the seating on piano hinges and use that hidden storage for appliances that aren't needed often, along with your party items like serving platters and bowls," recommends New Orleans professional organizer Tami Hills. If you have beloved large furniture but are short on square footage, use your big pieces in creative ways. For example, store dry goods in a china cabinet to create a pantry in the open. No storage space in your bath? Use a solution on wheels (like this chrome beauty) to store towels and trinkets in style. Shoes littering your space? Try this small space solution: Create a shelving system in your closet beneath the hanging garments for your shoes, bags, and folded sweaters. You can even tuck a small, clean-lined bookshelf into the bottom of the closet to take advantage of vertical space—shelves always do the trick! Small spaces rarely have room for a big bookshelf, but if your books aren’t corralled together, they can look messy. Avoid this problem by stacking books vertically in one corner of the room—plus, you’ll add a bit of shelf space in the process. Tiny kitchens need seating space too. Grab a clean-lined stool to offer additional seating, but make it work double duty: Set a tray on top, fill it with your favorite liquors, and make the stool into an unobtrusive corner bar cart. In a small space, every inch of shelf space is valuable. Add two-tiered shelving to the top of your mantel with a shelf affixed to the wall. It provides a seamless addition of display space. Define each area of your space—especially if you have a studio apartment. Rugs help to create zones and define each nook, instead of giving the impression of one blurred, multi-functional room. Find creative ways to use objects that you already have. A gorgeous set of antique champagne buckets? Affix them to the wall and use them for flatware storage, as planters for flowers, or as graphic art. When in doubt, go vertical and take advantage of wall space in small rooms. Don’t be afraid to go big and bold with pattern in small spaces. Add touches of joy through pattern mixing on beds, framed photos, and vibrant wallpaper. Mix with serene neutrals for a grounding base and joyful accents. Don’t crowd small spaces, like this open-air porch, with furniture and plants. Use well-chosen, sculptural details, like these planters flanking the porch doors. This addition offers visual interest with vertical power but doesn’t eat up too much floor space. A tiny planter by the front door adds just enough charm for this compact facade. In a small space with one big focal point, like the stunning tub in this small bath, embrace simplicity. Here, bare, white walls give the illusion of more space, and the addition of one large piece of landscape art maintains the clean-lined, spacious, and elegant vibe of the room—but it also adds color, depth, and interest. When you need flexible seating in a small space, a banquette can be a great go-to. The chairs can be moved throughout the space, but lots of people—kids, friends, family—can crowd onto a banquette for breakfasts, homework, and game nights. Clutter is your enemy when you are styling a tabletop. Especially in a foyer, keep things simple with a few well-chosen lamps, frames, and beautiful objects. In a cozy family room, oversized sofas can be perfect for movie nights, reading hours, and long afternoon naps. If you aren’t concerned with having lots of room to move, fill a small space with comfy, symmetrical seating. Big sofas that mirror each other create an eye-pleasing design that will keep the space feeling clean, not crowded. It will become everyone’s favorite nook. If you have a small space to fill, look to small-scale versions of your favorite pieces, like the loveseat version of a beautiful sofa, or a side table version of a pretty coffee table. It will fill the space with style, only smaller. Who has room for all those pots and planters? Combine your favorite floral styles in one compact planter for garden impact that takes up much less space. It’s perfect for a small porch or patio. For design in small spaces, flowers work wonders. You can always change the colors and styles, but they add lively impact in vases, small planters, and window boxes. Nothing makes a kitchen feel smaller than a countertop filled with bowls, utensils, and cookbooks—in a word: clutter. Keep spaces bright, airy, and clean by using shelving and in-drawer storage solutions. In a small area, no corner should go to waste. This nook offers an efficient use of space by adding a refrigerator for drinks, shelving for storing glasses, and a marble-topped counter to corral a small bar and mix up cocktails. It adds party and prep space to a small kitchen. Take advantage of empty wall space with creative wall art. Fill a vintage basket with flowers, add art, or hang pretty, graphic objects for decor that doesn’t encroach on your square footage. Who uses the space? There’s limited square footage, so make it work for you, your family, and your pet’s needs by thinking through your daily routines. In this kitchen, a clever, hidden door opens to a cozy bed for a sweet pup. It saves space since there is no need for a kennel. In a small area, like this tiny guest bath, bold wallpaper and bright accents lend a lively and airy vibe to the enclosed, windowless room. Even in the smallest rooms, breakfast nooks add real impact. They have service—making everything from breakfast to homework to game nights a little easier. Find a way to carve out the space for a breakfast nook in your tiny home (with just a few chairs or a full banquette), and you’ll never look back. Have any awkward recessed nooks in your small studio? Crannies with no real purpose? Use that small corner for storage. Try tucking your furniture into the area—if you can find just the right size of desk or dresser, the nook will go from waste of space to ultimate storage solution. This home was a two-bedroom with a serious need for more living space. The second bedroom was revamped with turquoise walls and a queen-size daybed to create a multi-purpose den that easily can also serve as a guest bedroom. A daybed works wonders in a small space. It can function as both sofa and bed and adds increased flexibility and functionality to a studio apartment, guest room, or living room. This queen bed-daybed hybrid was created by affixing two headboards to a mattress base. No room to hang art on the walls? Stack it on the mantel and lean it against the walls. It adds instant style and a casual, mix-and-matched vibe. If there is more art than wall space, create mini galleries throughout the house and branch out—art isn’t just for walls anymore. Desperate for some green in your space but no room for pots and planters? Tuck a fiddleleaf fig in the corner, or line up tiny pots of succulents on a windowsill. The fiddleleaf fig will thrive in bright light and regular water, and the succulents require very little attention. Voila! No space for entertaining inside? Move things outdoors and entertain alfresco. The whole yard can be your living room as long as the weather cooperates. There’s no need for cramped cocktails inside when you can set up table and chairs under the stars. Space-saving pieces with thoughtful features, like the elements in this bath, make the most of a tight space. A single sconce and perfectly proportioned drawers (plus custom under-sink storage) ensure that this space is streamlined, ordered, and impervious to clutter. No room for tabletop lamps? No extra square footage for a floor lamp? Then sconces are the way to go. They add ambience, illumination, and functional style without eating up valuable floor space. Hide clutter with streamlined, minimalist-inspired cabinetry. This small kitchen maintains visual consistency by mirroring the style of the cabinets and bar. The glossy white hue keeps things light and airy too. A bar or island is also a great place to incorporate seamless storage—if you can, add drawers for all your tools and a place for a trash can. An island with storage keeps everything hidden and countertops looking clean, but the kitchen remains completely functional. Use a pair of ottomans to create a clever coffee table that doubles as additional seating. By setting a tray atop the fabric ottoman, you add a sturdy place to set a cup of coffee or style an array of books and beautiful objects. While it may be tempting to toss a basket under an open sink for impromptu storage, adding permanent storage can be a better—and more attractive—option. A hefty, enclosed series of drawers and cabinets make a real impact while hiding any and all of the clutter that is bound to accumulate. When small spaces require multiple functions—like this dining room-living room space—cluster furniture to create defined spaces. Instead of a single sofa, add a sofa and a loveseat at a right angle and tuck a small table in the open corner. Much like puzzle pieces, well-chosen furniture elements can fit together closely and seamlessly without feeling cramped or cluttered. It’s quintessential small-space advice: Paint your walls white. And it’s a classic tip for a reason. White walls add an airy lightness that makes any small room feel more spacious. White walls can work wonders, but in a small space with lots of windows, add a vibrant color that draws the eye in and interacts playfully with colors both inside and outside. That vibrant color can be found in pillows or art, but for a bold addition, paint the ceiling. This ceiling is adorned in a deep, saturated emerald hue, a nod to its waterside setting, and a gorgeous design element for this small living area. When you have lots of pieces that you love in a small space, embrace the vivacity created by the mix, but use a neutral rug in a subdued pattern to tie all of the colors and textures together. Even the most eclectic of spaces needs a grounding base, and a rug can offer that stability. If there are any architectural or design elements that aren’t functional or that you don’t want to use, then change them and make them work for you. Here, the designer covered the front of the fireplace with antiqued mirrors. This effect adds interest and makes the formerly boarded-up hearth a welcome sight, not an eyesore. Instead of leaving it open to access, the designer placed matching chairs in front of the fireplace. There’s no need to access the area, so seating works perfectly here—and looks great when reflected in the fireplace’s new, mirrored design. No room for a full set of kitchen cabinetry? Try using freestanding pieces, like this antique case, that can be hung and repurposed as over-the-sink storage. It’s simply inspired. Tiny spaces are the perfect places to branch out and try bold wallpapers and paint colors. The vibrant wallpaper in this small bath packs just enough punch. In this space, the owners enclosed an upstairs balcony to form a second-floor study. Instead of a landing that was only used for passing through (a.k.a., wasted space), now the room is perfect for lounging or hosting guests, who can sleep on the room’s foldout sofa. Your space should evolve with you, but it isn’t always convenient (or in the budget) to buy new furniture to fit your space and your mood. Make changes with pillows and accents. Mix and match colors and patterns to create a brand new room in a snap. If you have limited space but also have a big family or lots of regular guests, focus on the flexibility of the pieces, colors, and design elements that you already have. This family created a bunkroom by lining up four Jenny Lind beds painted in bright red. It’s a maximized space that is also flexible—it’s great for kids and guests alike, and the configuration can be changed on a dime. This cramped kitchen doubled in size when the owners took out the wall separating the breakfast room and kitchen. The open floor plan makes the whole area feel more spacious. There are few other places in the house that can become as cluttered as this tiny corner. Use a bedside table with a substantial drawer to store and hide unwanted clutter, and style the tabletop with a simple lamp and carefully chosen design elements to keep things simple—and peaceful. This small foyer doesn’t have room for a big desk or other substantial furniture, so this small, brightly painted bench works wonders. It adds a pop of color to a neutral, dark space, and it provides a perfect perch for groceries or bags. Make the most of in-between spaces, and remember how you use the room. Design for function—design for real life. In a narrow space like this living room, don’t be afraid to forgo typical design features if they don’t work in the area. This room doesn’t try to squeeze a coffee table between the parallel sofas; instead, it allows the seating to flank the focal point of the room, the gorgeous fireplace, and it leaves plenty of legroom between the sofas. This birch-bark cardholder is used for Christmas cards in December but can be customized with photos and keepsakes all year long. Incorporate simple, flexible elements (like photo displays) into your space so that you can update them—and so that guests can fawn over them. A beautiful feature, like this birch-bark cardholder, can also stand on its own without additions. If you don’t have a dining room—or if you decided to turn the dining room into a living room and now need a place to eat—try tucking a table and chairs into the kitchen. It’s easy enough to create an eat-in kitchen, even if you are tight on space. Try a foldout café table and two chairs for a tiny space, or a banquette and substantial breakfast table for an area with more space to move.